Looking for more ideas on how to spend your days in Paris? You must download our Free 4-Day Paris Itinerary! Lily Heise, the blogger behind Je T’aime, Me Neither is INSIDR’s guest writer and in this article she shares some of her favourite romantic Paris parks and gardens. Read on to discover the best parks in Paris. The best gardens of Paris are among the most beautiful in the world. With over 450 green spaces across the city, from intimate squares to sprawling woods, there is something for everyone. It’s hard to choose which ones are the most romantic since they virtually all are, however, there are some which stand out above the rest for a cozy moment with your sweetheart. From the big names to hidden pockets, here are some of my favorite romantic gardens. One of the most enchanting aspects of this garden is the fact that it’s a hidden oasis of verdant tranquility bordering some of the busiest parts of the city: the tourist packed Louvre, buzzing Châtelet and the shopping central Opera. Entering from the south, you are instantly greeted by the whimsical Buren columns, installed in 1986 in the “Cour d’Honneur” of what was once the residence of Louis XIII’s Prime Minister, le Cardinal Richelieu. It was subsequently the Paris base of the Duke of Orleans, the King’s brother who throw rather risqué parties here. One could hardly imagine this given the sublime peace that now reigns over these graceful gardens. Stroll hand-in-hand along under the linden and chestnut trees, sip a drink on one of the café terraces or soak up some rays on a bench made for two. The Marais has some of the loveliest secret gardens of the city and this is one of the most romantic. Pack a picnic or pick up some pastries at delicious bakeries of the area and surprise your sweetheart as your veer off rue Hesse (between Turenne and Bd Beaumarchais) and into this magical courtyard decked out in lawns bordered by trellises of climbing roses. This garden has a similar atmosphere to the above, but with more intimate places to snuggle up with your modern day prince charmant (or princesse). You’ll already be getting wows as you cross through the imposing gate into the glorious courtyard of the Hotel de Soubise, now the National Archives. More “oh”s and “ah”s will pop out as you cross through the imposing doorway in the far right corner and into this series of private gardens which once belonged to the various mansions flanking the streets along this city block. The first section has some pretty alcoves adorned with pergolas, flowers and benches where you can ponder the luxurious life of the aristocrats who used to stroll through these same spaces. Pick up a falafel at l’As du Fallafel or a sweet treat at L’´Eclair de Genie to be enjoyed in this pocket garden hidden off rue des Rosiers. This small green space of yet along private mansion of the area features something much more exciting than its small patch of grass: a medieval watchtower. It is one of the few remaining visible sections of the protective wall King Philippe Auguste constructed around the city in the late 12th/early 13th centuries. After you’re finished your snack, you can see the largest section of what still exists of the wall, running along the basketball court behind the nearby Saint-Paul-Saint-Louis church. Of the handful of larger parks in the city, it’s hard to beat the romantic atmosphere of this gorgeous garden. Much less crowded than its famous historic counterpart across the Seine, the Tuileries, this vast park combines elegance with modern Parisian living. A favorite of local Left Bank residents, its tranquil alleyways, dotted with sculptures, are perfect for a romantic meander. Don’t miss stopping by Medici Fountain, a renaissance “grotto” fountain located on the east side of the palace, both built by the Italian Queen Marie de Medici. This little known park is a secret delight. Hidden behind a large wall, it was once the the garden and vegetable patch of the Filles de la Charité convent. Today, it retains this spirit with a “pedagogical” garden and a long wine-laden pergola lined. It has plenty of benches where you can savor a moment of delicious silence to the backdrop of what remains of the 17th century convent buildings. Another very hidden park, this small square is lost at the end of the rue Réclamier (the previous name of this park). It’s one of closest places you’ll get to a secret garden in Paris. You can slowly wander along its narrow paths, enveloped in trees and flowers, to reach a secluded bench where you can cuddle up with your amoureux to the sounds of the gurgling little waterfall. Not much of a secret anymore, the original “High Line” is still one of the most romantic, and offbeat, places for a stroll in the east end of Paris. Running along the elevated tracks of the former commuter railway, the refurbished walkway starts behind the Opera Bastille and, in one for or another, leads all the way to the Bois de Vincennes. You don’t have to stroll its whole length, a casual amble amidst the crawling rose bushes, patches of lilies and tulips and towering bamboo will win your partner over to its charms in a matter of minutes. Due to its height it also offers unique views of a different side of Paris and on the way back you can peer into the curiosities of the artisanal workshops which occupy the street-level spaces under the tracks. Within the huge Bois de Boulogne is this bucolic jewel with an intriguing past. In 1775 Marie Antoinette bet her brother-in-law, the Count of Artois, that he couldn’t convert this newly acquired property into a leisure chateau and park in less than 64 days. He took on the challenge with fervent gusto, winning the bet and successfully creating one of the most exquisite green spaces in the city. Today the park is home to over 10,000 rose bushes, hundreds of other flowers, charming meadows and plenty of secret places to steal a kiss. 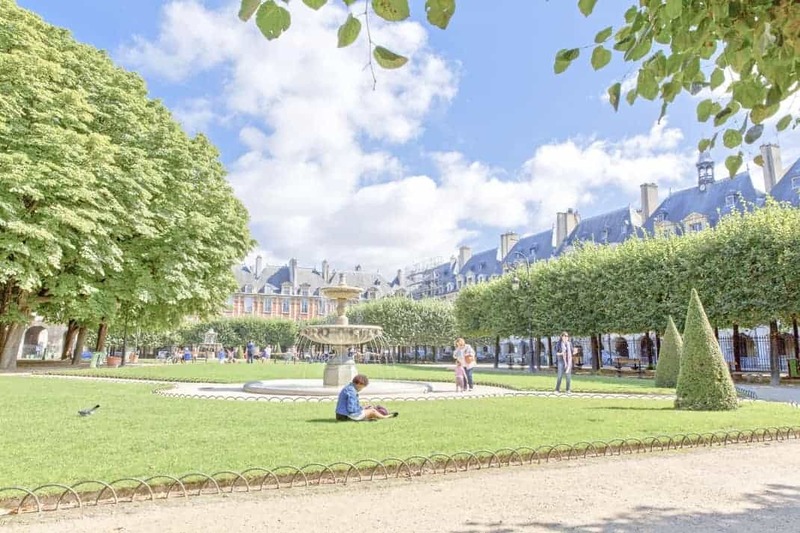 Built at the end of the 18th century as the outdoor playground of the newly established aristocratic district of the 8th arrondissement, it is a much loved green space of the residents of the northwest and also a favorite of the team at Insidr Paris! Surrounded by opulent mansions, the elegant park has a pond edged by fake Roman ruins, regal statues, beautiful beds of seasonal flowers, shady benches and sloping lawns which beckon lounging lovers. Feel free to check out Lily’s wonderful blog, Je T’aime, Me Neither here.